Creation of a processing center for fruits and leaves coming from reforestation actions. Setting up a fair trade branch. The Kichwa local populations regrettably seem disconnected from the economic reality. For most they are small farmers spread out a large territory and they usually face a lot of problems to sell their production. Since they haven’t got their own means of delivery toward urban centers, they shall be subject to unfavorable shipping conditions dictated by unscrupulous intermediaries. It is obvious to notice that the economic, social and environmental development of those people depends on sharing the local technical means. Federating the farmers was indeed an inevitable step to achieve this purpose. However it is necessary to go beyond that first step and propose a global and sustainable solution. Ishpingo foundation’s answer to the problem described above was, in accordance with local communities, to create a farming fair trade cooperative as close as possible to the farms. This proximity is essential to be able to share local technical means and production facilities as we said before. In 2015 Ishpingo launched the first step of a feasibility study and the primary results were really optimistic. However, as it may be predictable, they also revealed several major issues such as : the great number of farmers to federate, the existing tensions between communities and their problem to collaborate, the cumbersome administrative procedures, the cost related to the creation of that kind of structure which is quite high. It is important to note that Ishpingo replants tree species presenting long cycle growth which can demoralize the farmers. Nevertheless we managed to negotiate agreements with them. These agreements offer them guarantees such as : sustainable fruit harvesting for self-consumption or resale, help for legal sale of lumber through the implementation of forest management plans, sustainable leaves harvesting to produce essential and fatty oils. The second step of the study took place in 2016. We realized a complete production capacity survey for each fruit tree species on every single plot we had reforested since 2008 in order to get a precise estimation of the fruit supply capacity for 2017 and the following years. We quantified the volume of fruit sold locally (Tena) and nationaly (wholesaler of Ambato) in order to figure out which market was the more interesting but also to select the species presenting the best market potential. Cost of the structure and the necessary equipment. The quality, prices and characteristics of the sold products. The administrative and legal steps to be taken. The partnerships and synergies to develop. In 2017, we have produced and distributed samples (fresh fruits, pulp, jam, essential oil) in order to identify the best products and fix selling prices. Fruits are bought to the beneficiaries to be transform using traditional methods. Ishpingo foundation takes in charge the marketing aspect. First we propose our products for free to restaurateurs, ice cream sellers, hotels, greengrocers, individuals and different industries. 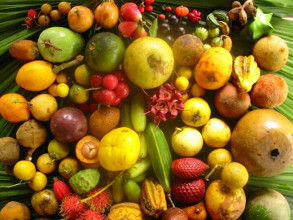 We proceed like this because we do know that these food professionals will immediately notice the taste and the nutritional qualities of fruits and products resulting from reforestation. Then it becomes possible to sell them. That way local sales increased well : key limes for fish restaurants, ramboutans and salaks for fresh markets, pulps and jam for hotels, restaurants, ice-cream sellers and even for individuals. In 2017 the sales stucture reached a turnover of around 4.500 US dollars. It is a promising start that encourages us to continue this approach. Thereby the Ishpingo Foundation continues to buy fruits in 2018 with the underlying objectives of gaining customers loyalty as well as increasing volumes. In order to be able to process the fruits coming from reforested plots in pulps, jam and essential oils, we have been gradually equipping with the necessary industrial stuff. We now own a real small craft factory that respects the rules of hygiene and safety. The visits we paid to the cooperatives of Salinas de Guaranda were essentials to evaluate properly the different aspects of what we wanted to achieve : costs of the selling unit, legal status, administrative procedures. In 2018 thanks to new funding, the Ishpingo Foundation started the construction of a dedicated building whose production processes will be more profitable and more respectful of sanitary conditions. It is scheduled to be up and running early 2019. We also are about to get sanitary records for each of these products in order to distribute them nationaly. By 2020 we plan to get a biolabel and a fair trade label that will open us the door of international trade. For 12 years Ishpingo has been achieving its purposes little by little. Nonetheless there is still a lot of work to finally be able to set up an ethic and sustainable development model which will benefit the entire population.